Hier geht es um einen Twin Reverb aus den Siebzigerjahren. Er funktioniert einwandfrei und klingt richtig super. Ein Twin Reverb ist ja sozusagen die Referenz in Sachen Clean-Sound und eine perfekte Pedal-Plattform. This 1976 amplifier has been used professionally by a very popular lead guitarist, bought by him with proceeds from this bands first number one hit !! It has been modified with heavier duty casters ( the standard ones were prone to collapsing !!) and, as can be seen, fitted with the "classic" 70's tilt bars,It has recently been fully serviced including point to point circuit drop testing, The facia and fabric has been left original and so "looks" like a real "bluesmans" rig !! Regretfully I being 75 now and living in a sheltered place, can't use it/CARRY IT!! any more . Call me on 07774470087 if you fancy a "buy it now deal" but, you need more than £500.00 yes yes !! Cash on collection of course !! Regards Old Bob Ps. I shall NEVER .try to "post" this !! The original tube chart is intact, noting the AB763 circuit. 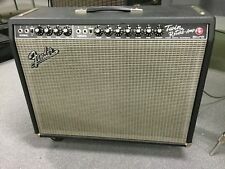 Up for sale, a 1969 Fender Twin Reverb in excellent condition and in good working order. It's as classic and pure a design as Leo Fender ever created! 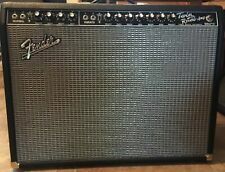 Pre-Owned Circa 2003 Fender '65 Twin Reverb Combo Amplifier Blackface Clean! 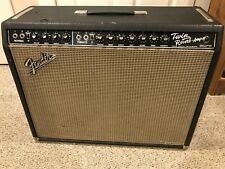 Fender manufactured the Blackface Twin Reverb amp from 1963 to '67. From its introduction in 1963, it has appeared on countless iconic recordings. Many musicians here at Sweetwater own a Twin — either an original or reissue — and use it relentlessly. Außerdem ermöglicht der Amp einen schnelleren Gain-Einsatz und eine Reduzierung negativer Rückkopplung für eine bessere Ansprache. Die zwei 12” Celestion® G12V-70 Lautsprecher des ’68 Custom Twin Reverb sorgen darüber hinaus für das charakteristische Rock’n’Roll-Feeling. Fender '68 Custom Twin Reverb Product Overview by GAKThe 1968 Fender Twin Reverb is reimagined in this updated version. With a silver-and-turquoise front panel and classy aluminum "drip edge" grille cloth trim, the Twin Reverb received a fresh new face as it remained the backline amp of choice for pros and amateurs everywhere. Axe Heaven Fender Twin Reverb AmpAxe Heaven Fender Twin Reverb Amp. Tube Complement for Fender Twin Reverb JJ/Tesla Brand includes: (2) T-12AT7-JJ (4) T-12AX7-S-JJ (1) T-6L6GC-JJ-MQ (Apex Matched), which includes: (4) T-6L6GC-JJ . GARAGE SALE We are happy to offer the following classic spare 1970s Fender Twin Reverb Control Panel Chrome / Blue Line Original Condition , Good / Light Wear. (1) T-6L6GC-JJ-MQ (Apex Matched), which includes Part Number: SET-FENDER-123_JJ_MGS. It was done very nicely you think it was original! tolex looks good, hardware is great condition,cab is also in good condition! JJ/Tesla Brand includes: (1) T-6L6GC-JJ-MQ (Apex Matched), which includes: (4) T-6L6GC-JJ (2) T-12AT7-JJ (4) T-12AX7-S-JJ . Tube Complement for Fender Twin Reverb - 1983 JJ/Tesla Brand includes: (1) T-6L6GC-JJ-MQ (Apex Matched), which includes: �� (4) T-6L6GC-JJ (2) T-12AT7-JJ (5) T-12AX7-S-JJ .